Back in early 2017 Yen Press started publishing mangaka Kei Sanbe’s popular Erased series. 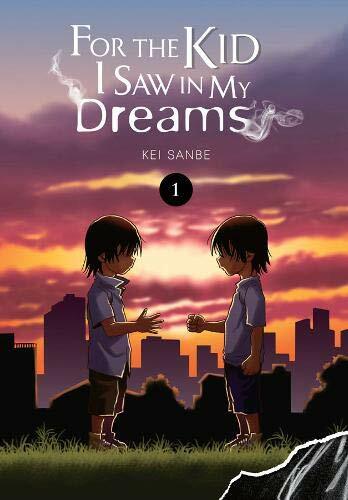 With that series now complete, the company has moved on to Sanbe’s new series, For the Kid I Saw In My Dreams. Today I’m here to check out the first volume and find out if it’s another hit in the making. The story follows Senri Nakajou; thirteen years ago, Senri’s parents were murdered and his twin brother kidnapped. Due to a mystical ability that the twins had, allowing them to sometimes share their pain and sight when hurt, Senri knows that his twin, Kazuto, wasn’t killed immediately but did eventually die. Now, Senri searches for any clues that could lead him to the killer, hoping to take revenge for the loss of his family. This is a story of revenge and a gruesome killing shrouded in mystery. When we’re introduced to Senri, it’s quickly evident that he’s a character who doesn’t walk the straight and narrow. He often gets into trouble and spends his days organising petty crimes against his fellow high-school students, such as secretly orchestrating the robbery of a student’s cram school tuition fees only to ‘help’ them get it back – at a price. One day while hanging out with his gang buddies, Senri spots the person on TV whom he believes could be his family’s murderer and rushes over to the location the man was last seen working at. However, upon arrival, Senri gets more than he bargained for as nasty debt collectors are also after the man and willing to do harm to anyone who gets in their way. The set-up for The Kid I Saw In My Dreams is certainly intriguing and at face value sounds interesting, but sadly it didn’t live up to any of my expectations. This manga has a lot of issues, but let’s start with perhaps the biggest one: Senri himself. Kei Sanbe just doesn’t make Senri likable. Senri lacks depth, or anything that makes him original for the reader to grab onto. This is likely because Sanbe doesn’t do a good job at conveying Senri’s inner thoughts and emotions. Senri clearly loved his twin brother, and Kazuto’s death terrifies Senri and leads to him vowing to track down the murderer in an effort to overcome his trauma, but while this is something I sympathise with, I don’t feel I understand Senri well enough to invest in his chosen path. I think that’s a big problem when, in a story like this, we should be rooting for the protagonist to overcome his enemy, but I just don’t care at all. None of this is helped by the fact that Sanbe’s artwork is really bad at depicting emotions. His artwork was a criticism that I held against Erased when I reviewed it and I’d hoped that it’d improved at least a little between the series, but that sadly isn’t the case. Because all Sanbe’s characters look stiff and don’t portray the nonverbal details of how they’re feeling, it’s difficult to really work out what’s going through their heads. For an emotionally driven story like this one I feel that’s a huge flaw. Characters have no depth to them, no emotion in their eyes and no weight in their hair. They feel flat and don’t move well panel to panel, which prevents you becoming absorbed in the story. Worse, Senri’s character design feels like it could have come straight out of Erased. There is nothing unique or original to it in the slightest. Like the characters, the rest of the artwork is also fairly stiff and lacking in detail. Most panels are quite empty except for the characters, and even those that aren’t don’t invoke your curiosity to look at every little detail. The best of the artwork is in some of the action scenes when Senri is fighting thugs, but these, too, aren’t anything special either. By the time I’d first finished the volume I felt that it doesn’t offer anything new or exciting to the genre, nor does it offer even a decent generic read. In fact, if not for the mangaka behind it, I’d probably be giving it an even lower score than I am. As I thought about the book more over the weekend, my opinion on For the Kid I Saw In My Dreams soured even further. I have quite a high tolerance for series that aren’t quite up to scratch but intrigue me enough to carry on anyway, but this time I genuinely don’t feel like I want to go back for Volume 2. This, for me, is the real sign that the problems in this book are just too much, even for fans of this genre. If even I don’t want to continue it then I highly doubt anyone else is going to have a better time with it. This release comes to the West thanks to Yen Press and has been released in a hardback edition with colour opening pages, which matches how Erased was released (although this is a single volume rather than Erased’s omnibus editions). While I’m grateful for the consistency in how they’re releasing Sanbe’s work, this format does push up the price of the release and further prevents me wanting to give more of it a chance. It’s quite a commitment at £13 a book. This volume has been translated by Sheldon Drzka and it reads well, although there is an oddity with sound effects going on. Throughout the volume there are speech bubbles with kana left inside, with an English translation written in smaller letters to the side of the bubble. This isn’t really an issue per se but it did seem strange to me when this is usually reversed. Overall, For the Kid I Saw In My Dreams is nothing but a disappointment. With what can only be described as poor and emotionless artwork, coupled with an unlikable protagonist and generic story, I struggle to find anything redeeming here. There are many better series in this genre that deserve your time more than this one. Overall, Dive! !’s first volume proves to be an enjoyable read. It’s somewhat difficult to recommend to fans of the sports genre with its reluctance to talk about diving in any detail, but those readers looking for a slice of life about diving will fare better.